News asia empty - DANMON ASIA LTD.
Ourflagship subwoofer now brings even more LF muscle to the SAM family. 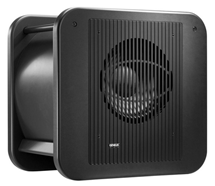 Deliveringa level of performance normally associated with much larger enclosures, the7380 subwoofer offers both high power and high SPL, with an extendedlow-distortion LF response and flexible bass management options. The7380 boasts 7.1 channel XLR analogue I/O, while an AES/EBU digital connectionallows both stereo operation – or full 7.1 digital, with the addition ofGenelec’s optional 9301 Digital Interface.The7380 is tailor made for discerning professionals in music, post, film orbroadcast that demand powerful, dependable LF reproduction in a surprisinglycompact form factor.